The shape of a steel I-beam strongly resembles a capital “I” in cross section, which explains the name. The steel I-beam has a strong central core capped with flanges on either side. 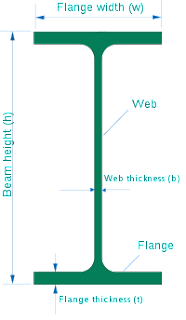 I-beams, also known as H-beams, W-beams (for "wide flange"), rolled steel joist (RSJ). 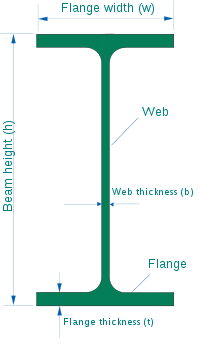 The horizontal elements of the "I" are flanges, while the vertical element is the web. By far the most common structural material is steel due to its strength to weight ratio. Steel is one of the most common materials used to make I-beams, since it can withstand very heavy loads in flexure meaning bending. Usually a beam carries vertical gravitational force but is also capable of carrying horizontal loads generally in the case of an earthquake. I'm gone to inform my little brother, that he should also pay a quick visit this weblog on regular basis to get updated from newest reports. Ηеya i'm for the first time here. I came across this board and I in finding It truly helpful & it helped me out much. I hope to provide something back and help others such as you aided me.